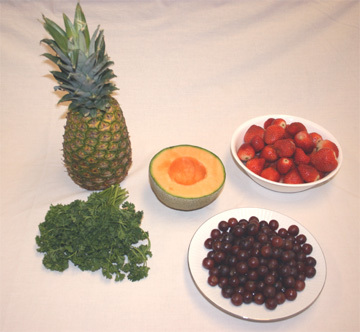 Below are easy-to-follow step-by-step instructions with pictures of how to make an edible fruit bouquet. 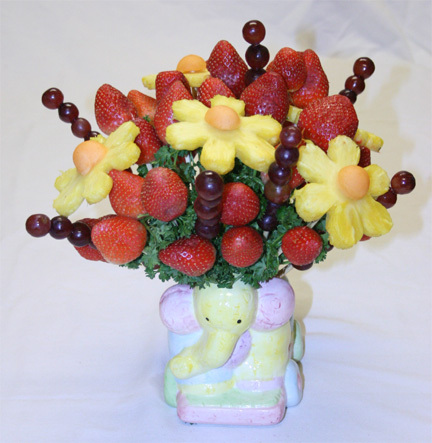 This fresh fruit bouquet is a wonderful baby shower centerpiece because it is also a tasty addition to your baby shower food refreshments. Instead of making a fruit salad, make a fruit flower bouquet! It is a fresh, striking and unique baby shower centerpiece idea. ***** Instructions ***** Depending on the size of bouquet that you wish to make, you will need fresh pineapple, strawberries, cantaloupe, grapes, and parsely. For the bouquet shown here, I used 1 large pineapple, 2 pounds of strawberries, 1 cantaloupe, 50 grapes and a handful of parsley. You will also need a few other items to make this edible fruit bouquet: a flower cookie cutter, a knife, a melon baller, kitchen scissors, bamboo skewers, a cutting board, a vase, and some floral foam or playdough (the floral foam is easier to work with, but the playdough works just fine also - click here for a homemade playdough recipe ). Step 1. 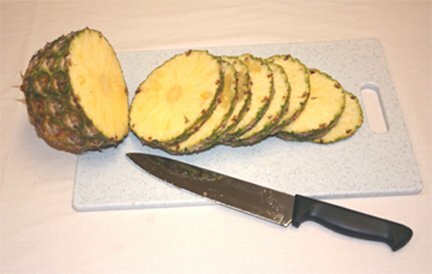 Using your knife, cut up your pineapple into 1/2 inch thick slices. (I used 5 slices total for this bouquet, but you can use more or less). Step 2. 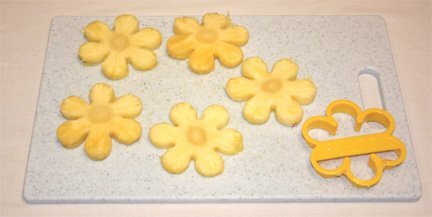 Using the cookie cutter, press each slice of pineapple and cut out a flower of pineapple. Step 3. 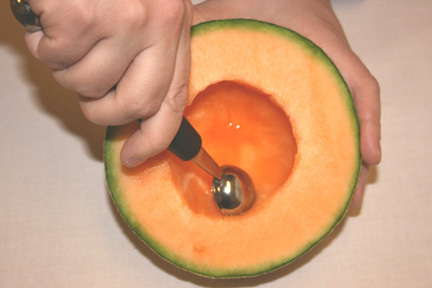 Using the melon baller, scoop out one ball of cantaloupe for every 2 pineapple flowers. 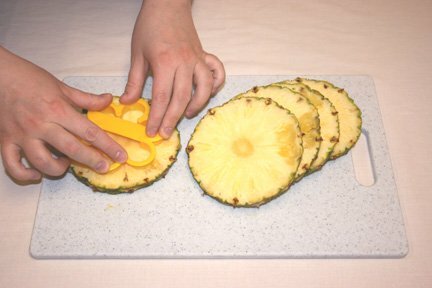 Cut the cantaloupe ball in half and lay the flat side of one half against one pineapple flower. Step 4. 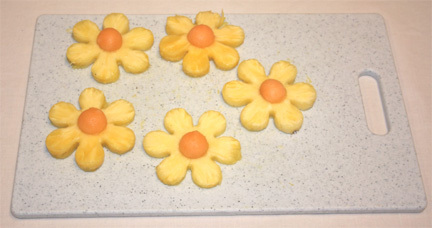 Now take each pineapple flower and stick a bamboo skewer through the center. 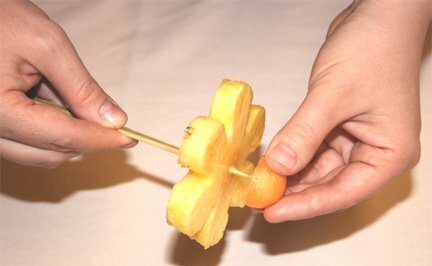 Make sure your skewer pokes through the pineapple about 1/2 inch. Now stick that part of the skewer onto a cantaloupe ball, but don't let the skewer stick out the other end of the cantaloupe ball. Do this for each pineapple flower that you have. Step 5. Wash your strawberries (you can remove the strawberry leaves if you want). 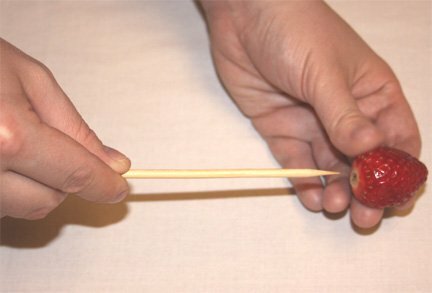 Then take each strawberry and stick a bamboo skewer into the top of it, but don't let the skewer poke out the other side. Step 6. Take a bamboo skewer and stick it through about 6-7 grapes. When you stick one grape on, slide it down to make room for the next one. Repeat this until your last grape. Make sure that the skewer doesn't stick out of the last grape (the one on top). 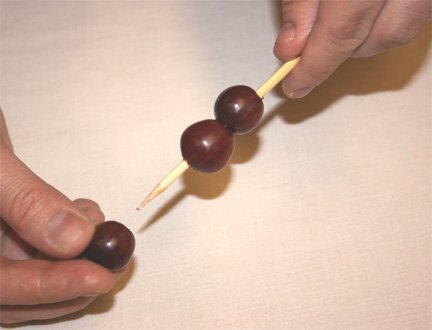 Then slide each grape up the skewer until they touch the grape just above it. I made 7 of these grape skewers for this fruit bouquet. Step 7. Put your floral foam or playdough into your vase (click here for homemade playdough instructions ). I used a baby elephant vase here, but you can use a flower vase, a basket or something else. I do recommend using an opaque vase so the skewers & playdough are not visible through the vase. I used playdough for this fruit bouquet. Step 8. Now you should have all of your fruit on skewers. 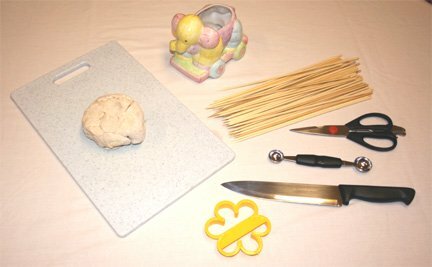 Place each skewer into the playdough at various angles. You will want to create a spherical shape to the bouquet, so place the outermost skewers on a large angle and make them shorter than the center skewers. I had to break a few inches off some of the skewers to get them to the right height (I used kitchen scissors to help me break the skewers). This step is the most time consuming because you want the bouquet to look perfect. If you have trouble, just start putting in skewers into the playdough. Then adjust each one to look how you want it. The key to this step is to adjust your skewer lengths. Don't be afraid to break a good part of the skewer off (if you break too much off, you can always use a new skewer - I had a LOT of extra skewers at the end). Also, the playdough tends to get quite full of skewers, so if you place a skewer in and it runs into another skewer, twist it a little bit until it slides past the other skewer. Another key to making your fruit bouquet look AWESOME is to have plenty of fruit. Having too few fruit skewers makes your fruit bouquet look bare and skimpy. You could stop at this point and have a cute fruit bouquet, but I recommend you move on to Step 9. Step 9. 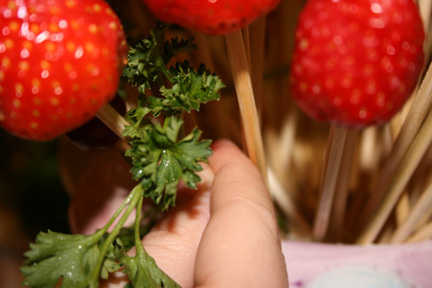 Once all your fruit skewers are placed, place some twigs of parsley in-between the skewers. This fills in the bouquet, hides the skewers and makes it look more like a flower bouquet. Tip: You may have to remove a skewer and drop in the parsley from the top. This will give you a little more room to work with. After your parsley is in place, replace any skewers that you may have removed. Once you have the parsley in place, YOU ARE DONE! 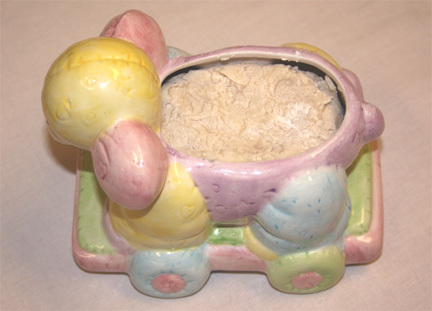 You have a delicious and unique baby shower centerpiece. It will serve as a beautiful baby shower centerpiece and your guests will love the taste of this fresh edible fruit bouquet. 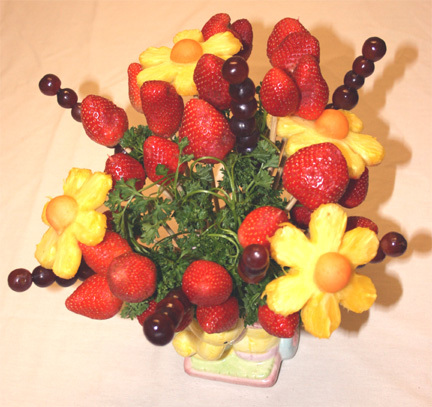 Place this fruit bouquet baby shower centerpiece on your food table or somewhere prominent. 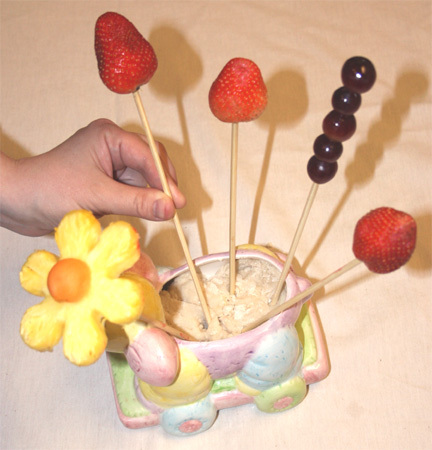 When you serve the refreshments, you could have the guests just pull the fruit off of the skewers, rather than pulling the whole skewer out. That way, the parsely won't be falling out all over. 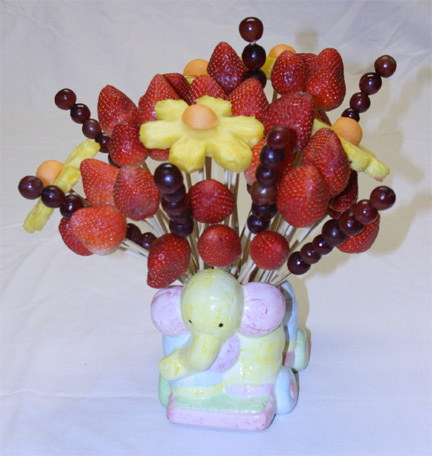 Good Luck making this tasty, edible fruit bouquet baby shower centerpiece!